The Penguins emphatically dismissed any concerns about a lack of motivation heading into this last stretch of games with the Atlantic Division title clinched on Thursday in Tampa Bay, playing an emotional 60 minutes of hockey and earning a hard-fought 6-3 win over the Lightning. Jussi Jokinen (2G-1A) and Pascal Dupuis (1G-2A) each had three-point games. Evgeni Malkin, Chris Kunitz and Tanner Glass (his first as a Penguin) also scored for Pittsburgh. They held the NHL’s third-ranked offense led by Steven Stamkos, Vincent Lecavalier and Martin St. Louis to just 19 shots, with Tomas Vokoun getting the win in goal. This game got very chippy and at times, it seemed like the fire marshals would be coming to regulate the overfilled penalty boxes. Though the Penguins didn’t retreat from any confrontations, they didn’t let it consume and distract them and stayed focused – eventually pulling away in the third for the win. All four players the Penguins acquired before the trade deadline – Jokinen, Jarome Iginla, Brenden Morrow and Douglas Murray – all recorded at least one point in the game. Jokinen starred with two goals and an assist, so let’s start with him. Knowing the right places to be at the right times in a game as fast as hockey isn’t easy, but Jokinen sure made it look that way on Thursday. The Penguins center astutely drifted to the paint on two separate occasions, the first time mirroring Morrow’s drive to the net and directing his shot attempt in with his skate. The second time, Jokinen went to the dirty area when Murray got the puck on the point, deflecting in the defenseman’s shot for his second of the game. Jokinen now has points in each of his first three games with Pittsburgh, scoring totaling three goals and two assists. Jokinen said after the game he’s been placed into situations where he can succeed since he’s been here, and that’s been a big part of his success. Murray’s assist was his second in seven games with Pittsburgh. And just one minute after getting his shot tipped in, the heavyweight Murray dropped the gloves with B.J. Crombeen for his first fight as a Penguin. The 6-foot-3, 245-pound Murray rained punches on the Lightning forward in a long, tiring bout. Iginla recorded a pair of power-play assists. It seemed like he had a goal when he absolutely teed off a perfect pass from Kris Letang in the second period, but it turned out Kunitz got a piece of it on its way to the net for his 21st of the season. The positive is that Iginla is shooting more than he had when he first arrived here. Finally, Morrow created the Penguins’ first goal with a beast of an effort. Dupuis chipped it up to him and he beat Teddy Purcell to the puck, holding off the pressing Lightning forward with his arm and body to keep him away and driving to the net. It’s exciting to see these guys get comfortable in black and gold and show exactly what they’re capable of. With what Dupuis has already accomplished in less than half a season, it’s mind-boggling to think of what he could do in a full 82-game campaign. Dupuis scored his 20th goal in his 41st game of the season on Thursday in Tampa Bay, reaching that mark for the second straight season and the third time in his 11 NHL seasons. It came on the power play, his first since Jan. 20. Before that, Dupuis’ last man-advantage marker came on Nov. 20, 2006. Dupuis also assisted on both of Jokinen’s goals, giving him his second straight three-point game and extending his scoring streak to four games. As per usual with Letang, he jumped right in and assumed his normal duties after missing a decent chunk of time due to injury, skating on the top pairing with Brooks Orpik and manning the point on the top power-play unit. Letang is an effortless skater and just has so much skill that he makes returning to game action after a long layoff look easy, when in actuality it’s not. He still has rust to shake off, but the good news is that he has seven games left to get back feeling comfortable before the playoffs begin – and he certainly got off to the right start tonight. “I felt pretty good,” he said. “Fun to be part of a match and obviously with the win, it makes it even better. Letang brought a calmness and a steadiness to Pittsburgh’s power play, which was just 1-for-14 entering the game but went 3-for-6 against the Lightning. Led by Letang, the Penguins did a better job of entering the zone cleanly and establishing position instead of having to dump and chase. The first goal actually came from the second unit, starting when Tyler Kennedy won a puck battle in the neutral zone, carried into the slot and sent a shot across his body to the net. Dupuis found the rebound and lifted it into the top of the net. The second happened as the result of pretty passing between Letang, Malkin and Iginla. Malkin eventually found Iginla across the slot, who pushed it back to Letang on the point. 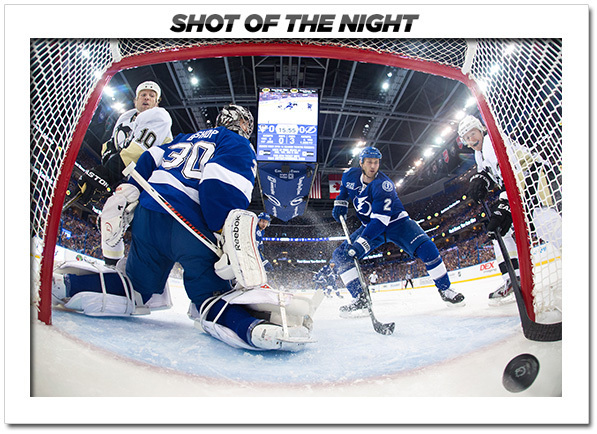 He gave a perfect pass right back to Iginla, who wound up and took a shot deflected by Kunitz past goalie Ben Bishop. On the flip side, the Penguins also allowed three power-play goals – finishing 1-for-4 on the penalty kill. The Lightning’s power play is brimming with talent, spearheaded by Stamkos and his wicked one-timer from the circle. You know it’s coming, but it’s hard to stop him when he gets the puck over there. After scoring the game-winning goal on Tuesday in Carolina, Malkin followed that with a one-goal, one-assist performance on Thursday in Tampa Bay. He looks like the ‘Geno’ we all know and love after dealing with injuries earlier in the season. Glass’ goal was his first point as a Penguin. Bylsma put Glass out on a Penguins 5-on-3 power play late in the game in hopes he would shake that annoying monkey off his back. It worked, as Glass scored his first career power-play tally. And hopefully that monkey is somewhere in an IKEA by now. Stamkos’ assist on Purcell’s first-period power play goal cut Sidney Crosby’s lead in the Art Ross race (leading scorer) to five points. Stamkos now has 51 to Crosby’s 56. Crosby, who has missed the last five games with a broken jaw, joined the team in Florida and attended Thursday’s game. Bylsma said injured defenseman Paul Martin (hand) will also be joining the team on the trip. “Both Sid and Paul Martin have seen the doctor earlier this week and (are) fit to travel,” Bylsma said. “They’re both going to be joining us here for the rest of the road trip. A good time for the team to get together. Sid joined us already and Paul will be joining us tomorrow. "I don’t know the rehab schedule for Paul. He did skate this morning in Pittsburgh, which is why he didn’t come with Sid."